You are here: HomenextTopicsnextViews of the city: images & opinionsnextMystery photos of Brighton and HovenextCan you identify them? Can anyone name the places shown in these mystery photos of old Brighton? If you can help – please leave a message in the Comments. This photograph is of William Street. The large arch doorway was, so I’ve been told, a bed and breakfast or Doss House for tramps, run by Lou Morris. 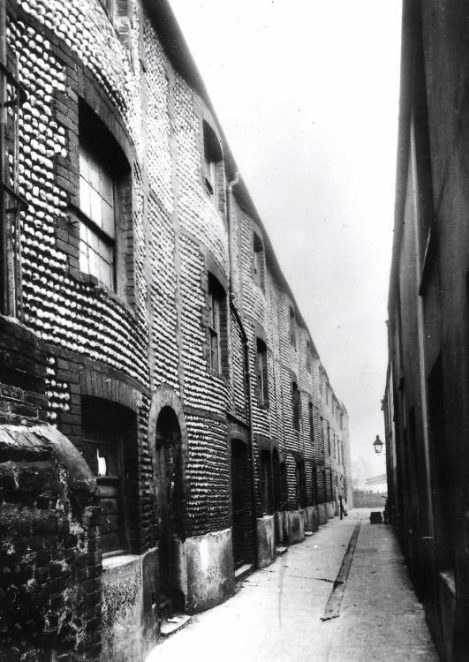 There is a lady called Rosie Sullivan who lives at 114, Albion Hill, who can remember this street as it is depicted and also remembers Lou Morris and his Doss Houses. Interestingly enough, I don’t know if you remember an expression that the Old Folks had, which was ‘ He’s so tired, he’d sleep on a clothes line!’ This expression derives from the habit in many Doss Houses where a length of rope was strung across the room and men actually leant across it and slept. In the morning it was cut down! This must have been the Good Old Days! The mystery photo of the boarded up shop is of Mrs Goldring’s bakers shop in William Street off Edward Street. Source: Pike’s Directory 1933/34. My great-great-grandfather, William James Allen, was born at 25 William Street in 1859. It was great to see a picture of the street, now demolished. It is the west side of William Street looking towards Carlton Hill. You may observe that the houses are boarded up awaiting demolition, which occured in 1937. I believe this is one of the photos from the James S. Gray collection. My mother was born at No.56 in August 1923. My grandparents lived at 55 William Street in 1908. Their names were Lillian Homewood, who married Richard Standing. I am amazed by the expertise of the contributors in identifying particular locations. I am really interested and as a resident of the town for all my life (60 years) would seek to know the best references available and where to research. I am able to pass on information to interested parties when asked, but mainly my information is gained from reading authorities like Tim Carder and Geoff Mead. I wish I had their knowledge and professional brilliance. This is a real puzzle since W.S. Hudson were corn merchants and forage contractors at 3 Sussex Street and Elliott Bros builders had premises in Circus Street at one time. It is not looking east up Sussex Street as the street is too short and level and not west across Victoria Gardens. It seems rather short for Circus Street – the building in the foreground on the right with the hoardings looks very much like the corner to me – and this isn’t what the corner of Sussex Street and Circus Street was like (the Grand Parade Chapel backed onto it)…. see Brighton and Hove in Pictures. And if it was looking south from the Sussex Street end it would mean the houses on the right backed onto the grand houses in Grand Parade and I doubt any did. At the end of the street I would have expected to see the rather imposing School of Art Building, not a row of garages. It could be Circus Street looking North with the entrance to Circus Court on the right towards the far end. But other pictures of Circus Street show it to be much wider than this street – at the north end anyway. 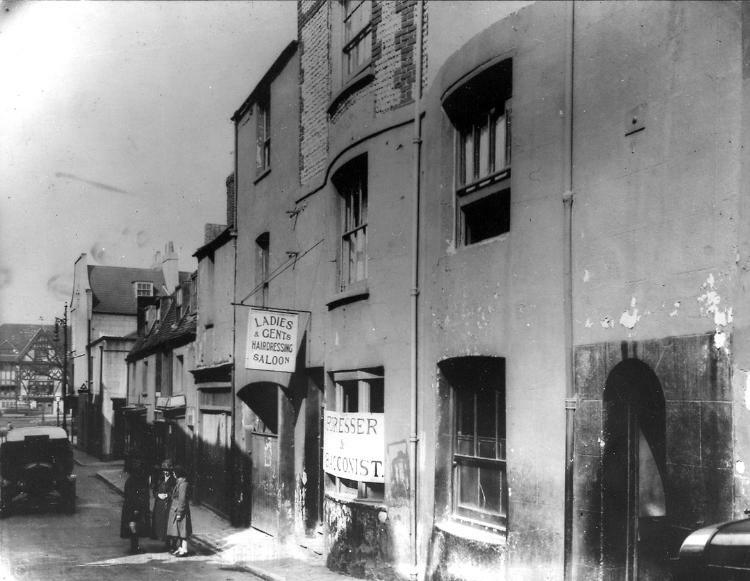 My guess is that it is Sussex Street Mews off Sussex Street and opposite to the end of Circus Street. It could be Sussex Court but I’d have expected to see the rows of houses up the hill behind it. That looks like the King and Queen in the background across the other side of Grand Parade so my guess is that this is Sussex Street taken from the junction with Ivory Place (outside the Royal Yacht Pub). If so the roadway you can see leading off right is Sussex Street Mews. But its only a guess. It was all demolished in the 1930s before my time. Er… ignore last comment. If its the King and Queen in the background this has to be the bottom of Carlton Hill and the turning on the right would be Circus Street or Carlton Court I thought at first it was Sussex Street but a picture on Brighton and Hove in Pictures shows a similar shot of the bottom of Sussex Street (a later one in 1940s after bomb hit the school clinic) and in the background you can see the old Astoria. I grew up in Brighton in the 1960’s/70’s and this photo looks similar to houses that were behind the station and Queens Road. James L Major and his wife Frances lived at 32 William St according to the 1881 and 1901 census. James was a coachbuilder and the 1901 census states ’employer at home’. If the numbers go straight that would make the Large Arch Doorway number 32 if they go that way, so I wonder if that was his. The 1891 census shows him living at Dinapore Street. Possibly Orange Row, off Tichbourne Street / North Road? I showed this to my mother-in-law, Edna, who has lived in Brighton all her life and she thinks this is possibly Jew Street. Some friends and myself think this picture could be Black Lion Lane looking west to east. My great great great grandparents were living at 44 William Street in 1881. Thomas Banks was a shoe maker and lived there with his wife Elizabeth and their family. I would say it was one of the former narrow ‘rows’ off of New England Road, looking from north to south and taken close to its junction with New England Road. Definitely looks like the King and Queen (an old haunt of mine in the early 70’s) in the background, which would make it the bottom of Carlton Hill. Circus Street School stood on the bottom right hand side of Carlton Hill before the area was demolished in the mid 1930’s and replaced with the Municipal Market. The current King and Queen buliding (almost definitely shown in the background) was built in 1932. The Municipal Market was completed in 1937, which dates the photo somewhere between these 2 dates! According to Ian Grant on another page of the Brighton web sight this is Carlton court demolished in 1933. You could get ‘tick’ at the shop but, if you failed to repay on Friday, the sons would ‘come round’ for the money. In 1881 my great aunt’s future husband Harry Turton lived at 49 William Street with his father William, a law writer, and mother Esther. They were all born in Hackney, London. No idea why they were in Brighton! Harry and Esther returned to Hackney after William died in 1888. W.T.Elliott were estate agents located at 50 Grand Parade, Brighton, Elliott Bros has offfices at the rear of 50 Grand Parade. 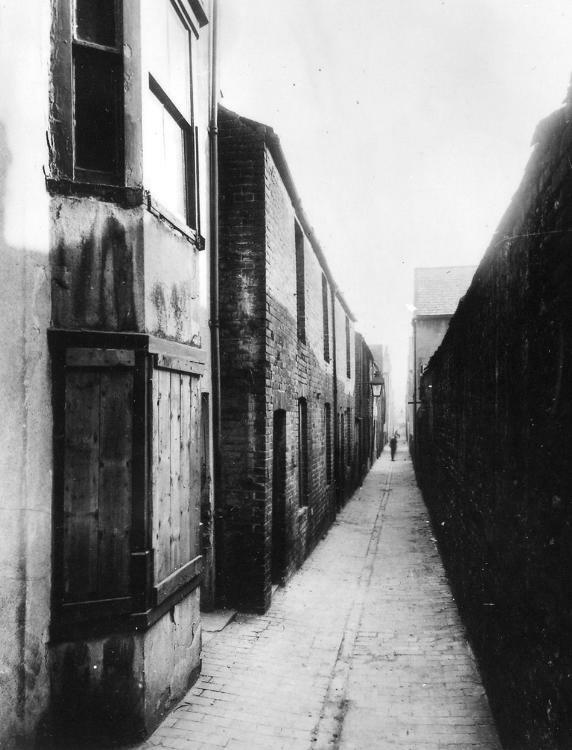 The street in the picture at the time it was taken was known as 3 Sussex Steet, now known as 3 Morley Street (north end of Circus Street) the buildings end of the street were occupied by Elliott Bros. The garages were used as timber/paint stores etc. whilst the upper areas were a joiners workshop. Elliott Bros occupied these premises until they ceased trading in the late 60s. The premises have been altered into offices and now have a pitched roof. I was born at number ten William Street and it was about three doors away from Lou Morris. Used to see dossers coming and going all night and day. Yes, taken from Carlton Hill, looking west at the King and Queen, taken roughly from the junction of Carlton Row or Woburn Place before the fruit and veg market was built in Circus St. I think Hectors House public house is still the same building though. I would like to hear from anyone that knows anything about my grandfather Lou Morris. My email is jesswmorris@gmail.com Perhaps Mr Duffy Newman can help? I would also say that this picture is the narrow row off new England Road behind what was Elder Street. Also Brian Dungate, was your father the caretaker at Stanford Road School? I think this is a twitten between Terminus Road and Clifton Street. It runs (or ran – I haven’t been in back to that area since I was in my teens) from Guildford Road right through to Terminus Road almost opposite Howard Place. I’ve been trying to find out which uncle my dad lived with after his mum died. I know they lived in William Street. I visited Brighton and went to the history centre where I checked the old electoral roles but, there were so many Newmans & Sullivans on William Street I am none the wiser. His mum died in 1920 & they lived at number 58. My dad said his uncle had a cart & later a horse so I think it must have been a Sullivan as they were hawkers. Any info would be a help. I can remember my father Spud Whatman, who lived in Sun Street saying that when there was a fight at Lou Morris’s doss house, Lou would lock the gate to stop anyone getting out and then wade in to sort it out. The bottom picture has the King and Queen pub in the far background so it must be Kingswood Street, about where the wood store is now. Picture one is unknown -but somewhere off Carlton Hill? 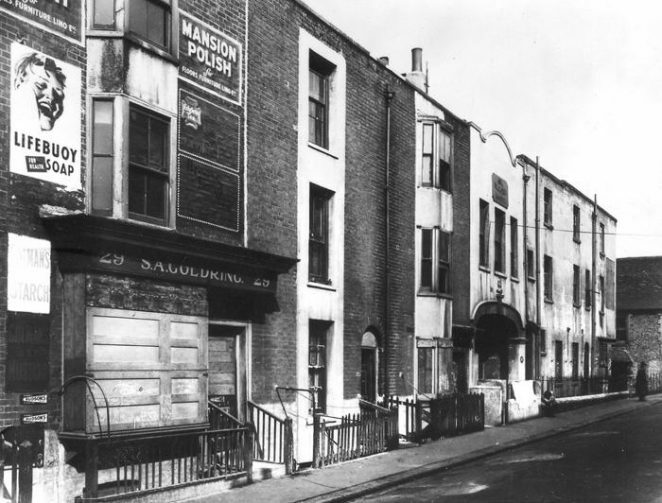 Picture two is Sussex St demolished in 1933 (Elliotts were the builders). Picture three is Carlton Court demolished in 1933. 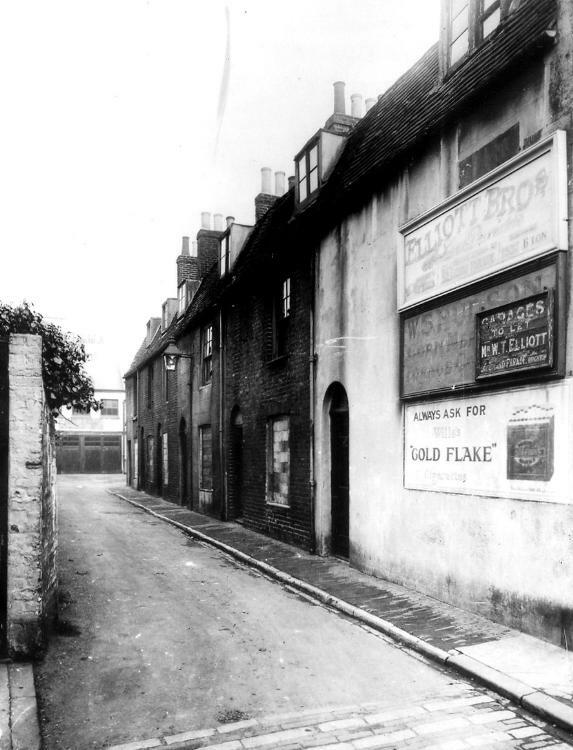 Picture four is illiam St (Goldring was a bakers). Picture five is Carlton Hill 1-9, demolished in1933 (the hairdressers was Cecil Day). Is the last but one King Street prior to demolition? My dad William Banfield was born at no. 60 in 1908. Love to know more. Mrs. Goldring’s Baker shop: the boarded up shop on William Street was my maternal Grandmother’s, Sarah Ann May Goldring! Pat Benham, thank you so much! Do you know anymore about this shop or does anyone else knows anything? My Grandfather died soon after he came back from WW1, shell-shocked and gassed. My Grandmother ran the shop with her remaining children until she could no longer do it. My grandmother had a total of about 14 children, including 2 sets of twins, most died at birth, but she was left with 3 boys and 3 girls to raise. The girls were Daisy, Lilian and Ivy, the boys, Frank, Sonny (Herbert) and Freddie. My Mother was Lilian May Goldring, she married Joseph Hemsley in 1928. I long to know more of those days, please. S A Goldring Bakery on William Street was run by my Grandmother, Sarah Ann. My mother was Lilian May Goldring until she married my Dad, Joseph Hemsley in 1928. Photo 4 William Street and photo 5 Carlton Hill nos 1-9? Really interesting to see the above comments about William Street. My great grandfather (George Harman) is shown on the 1881 Census as living at 56 William Street and my father (John Warner – 13 at the time) and my grandmother (Mary Ann Warner nee Harman) are shown on the 1911 Census as living in No 57 William Street. If anyone has any information or photos I would be delighted to hear.